One of my favorite summer photos of Albright United Methodist Church. Photo Credit: Larry Rippel. Last fall, the East Liberty Valley Historical Society put together a monthly lecture series on historic buildings around the East End. I had the opportunity to attend two of these lectures, both were filled with fascinating facts about buildings I see every day and building that are no longer in the neighborhood. 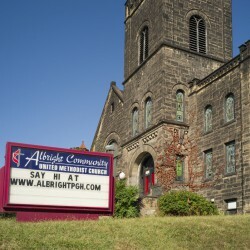 The Albright United Methodist Church building, which sits on the corner of Centre and S. Graham Streets, is one of the many buildings that is at risk of vanishing from the Bloomfield neighborhood. I submitted a nomination for the Albright Church building to the City of Pittsburgh Historic Review Commission last fall and the commission will be reviewing the nomination at their February meeting next week. Not only is Albright a beautiful building, but it has quite a bit of architectural significance. This Sunday, local historian and member of the East Liberty Valley Historic Society, Justin Greenawalt will be giving a lecture on the history of the Albright United Methodist Church building. Justin is an excellent and entertaining speaker and his talk is sure to contain some interesting neighborhood stories. This lecture will be held at East End Cooperative Ministries Community House and is free and open to the public. All are welcome to attend the lecture or come early and join the Albright congregation for their weekly church service which is also held at EECM. This is a great opportunity to meet some fellow history lovers and learn more about Albright, East End History and some of the great things EECM does for the community. East End Cooperative Ministries Community House (There are several entrances to EECM, please use entrance A on Station Street. There is lots of on street parking on Station Street and more in the EECM parking lot). Looking to learn more about local historic architecture?